The MSV-400 is designed for advanced laser processing and Inkjet deposition research and development, the tool also lends itself well to production capable laser processing. 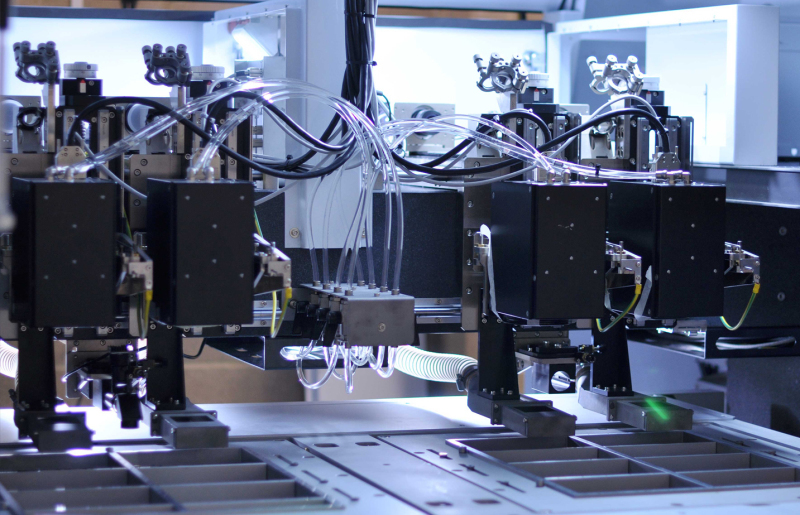 The platform has the ability to combine multiple process heads, fed from multiple lasers through complex beam conditioning optics, and a wide range of options and ancillaries can also be included. The tool is based on a granite slab with a granite bridge above, mounted on vibration isolators and a steel frame. The granite structure ensures thermal and mechanical stability of the system and excellent damping of external vibrations from the environment. Substrates of 610mm x 510mm can be processed and x,y stages of up to 1000mm x 1000mm can be used. The tool includes a large optical breadboard area above the work piece stages, so the system has a wide range of possible configurations. For example: a picosecond-pulsed laser with IR and green outputs, plus a nanosecond-pulsed IR fibre laser could feed 2x scanners (one for each wavelength), the lasers can then be selected and directed to the appropriate scanner via the appropriate beam-conditioning optics, by software-controlled moveable optics. The tool can include one or more machine vision cameras for part alignment and/or inspection, it incorporates appropriate laser debris/fume extraction, the tools is CE marked and is contained in an interlocked class 1 laser-safe enclosure, which is compatible with Class 1000 clean rooms.